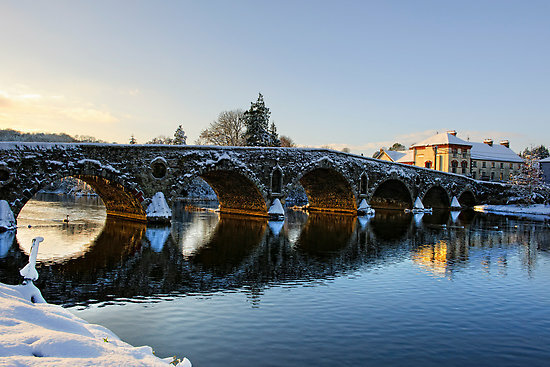 Graiguenamanagh (pronounced Graig-na- manna) means ‘dwelling of the monks’. The monks in question were sensible enough to place their abbey in the lee of 1703ft Brandon Hill, in the wooded valley where the Rivers Barrow and Black Water meet. This is the valley whose peace Sean O’Faolain so evocatively described. The River Barrow is crossed by an 18th-century seven-arched bridge built by George Semple. White water rushes over a weir, and the towpath is merry with wild flowers. Cabin cruisers moor beneath the remains of an Anglo-Norman castle. There is a long, pebble-dashed building in the centre of the town with an odd little belfry at one end. This is Duiske (Black Water) Abbey, now the Catholic parish church, but once the church of a 13th- century Cistercian monastery, the remains of which have been incorporated into the building. Duiske Abbey, whose buildings encompassed much of the town, began to fall apart in 1536 when it was suppressed. Although the monks continued to occupy it for many years, it gradually fell into ruin. The last tragedy was in 1744, when the tower collapsed into the nave. However, the debris from the tower was smoothed over to create a new floor and the west end was re-roofed to make a place of worship for the Protestant Church of Ireland. In 1812 the church was returned to the Catholic community and the long work of restoration began - to be completed finally in the 1980s. Its unprepossessing exterior contrasts with a splendid vista once the door is opened. The long nave, with its ancient stone and high clerestory windows, conveys the simplicity and serenity the monks knew. As a link with the past, an effigy of a 13th-century knight found in the ruins was installed by the main entrance. He is unknown - but he makes a suitable guardian. Descend some steps from the south transept - to the original pre-1744 floor level - to see the magnificent Transitional (between Romanesque and Gothic) processional door of about 1220, used by the monks on ceremonial occasions and still there after seven centuries. Graiguenamanagh is a real hidden gem that is worth a visit on your tours of Ireland.